Kids love dirt. For some reason they’re drawn to it. I remember loving the dirt when I was a child. I loved it so much I ate it. I know now that it was an iron deficiency. Anyway, kids love dirt. And my kids really love dirt. Especially my two little ones. They could spend all day outside digging in the dirt if I’d let them. But I don’t. Because I’m a responsible mom. I feed them, bathe them, change their diapers, etc. You know – responsible things like that. Guess who else loves dirt? But not in the same way as my children. 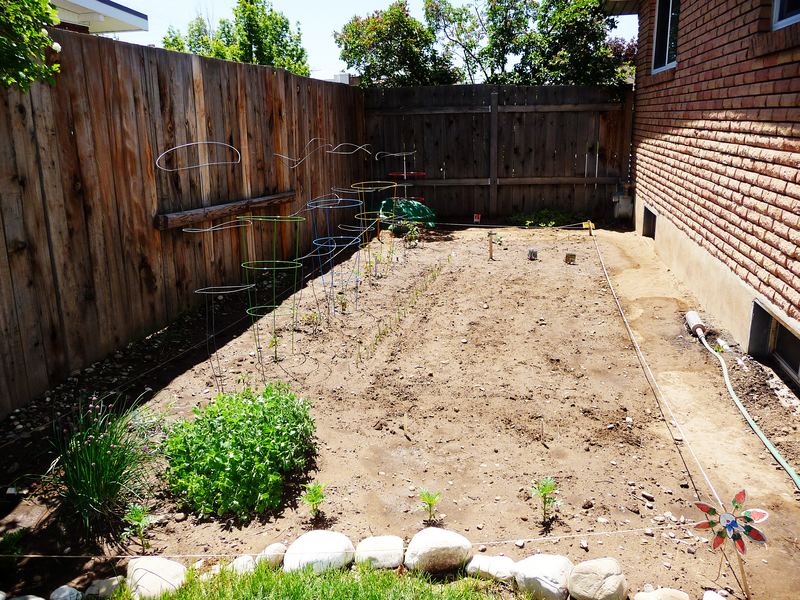 I love to plant flowers, trees and vegetables in the dirt. And since I’m in the dirt, my children think that they can be right next to me in the dirt. And they like to dig up my flowers, trees and vegetables. I like to plant them; they like to dig them up. So I came up with a solution to this nasty problem. I turned to . . . The Turtle! There it is. The Turtle. 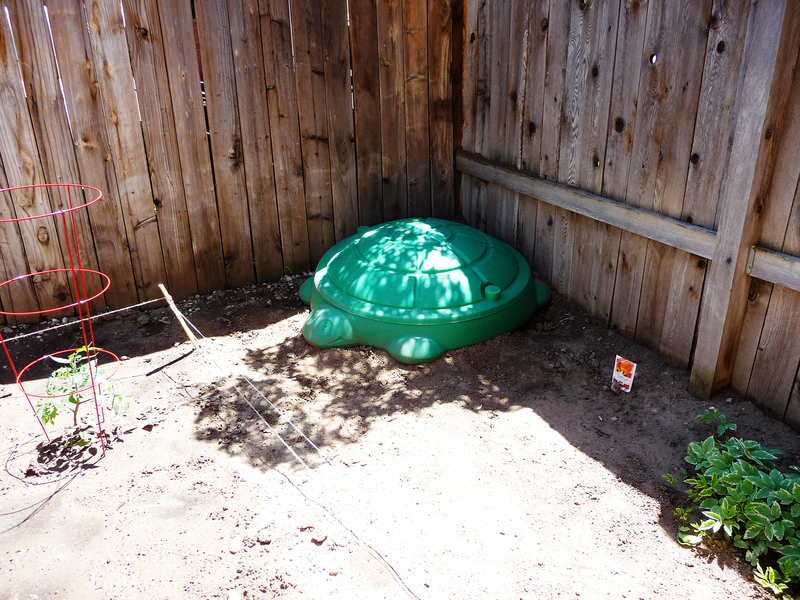 It rests comfortably in the back corner of our garden area where it gets more shade than not. 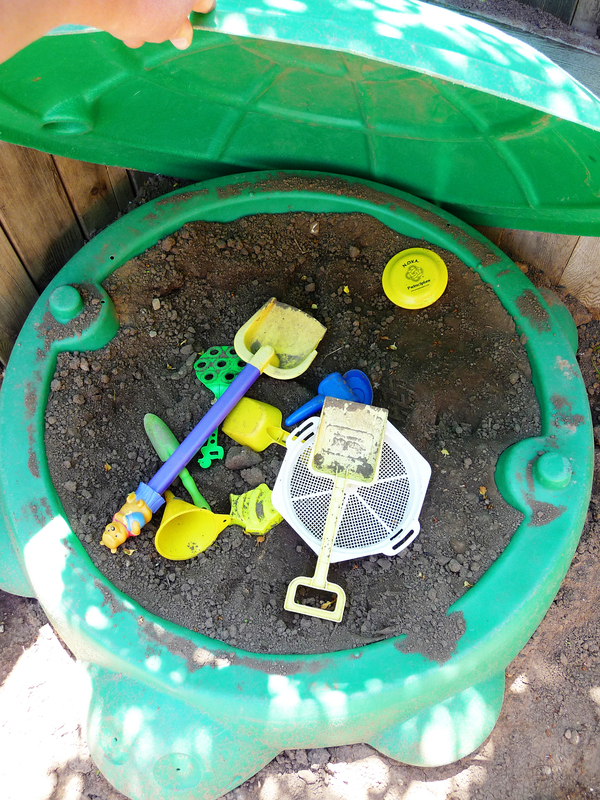 I can keep an eye on the kids while working in the yard and garden and they get to dig in the dirt to their heart’s content. The Turtle is filled with dirt, not sand. Why? Because I already have lots of dirt, it’s easier to wash off and it won’t matter if they throw it on my garden. The toys just stay in there so it’s always ready for little hands. Oh, and one more thing. I put twine around my garden this year and told the kids that they couldn’t cross the line (except the 4 oldest when they need to weed). I didn’t know if it would work because it’s just a little twine, not a giant cement fence or anything like that. See the turtle in the back left corner? But it’s working! They’re actually leaving my garden alone. Maybe it’s because my kids have a place of their own in which to dig. Maybe it’s because they fear the wrath of Mom. No. It couldn’t be that. I’m sure it’s just that they want to obey because they love me so much. This entry was posted in Organizing and tagged digging, dirt, flowers, garden, trees, turtle, vegetables. Bookmark the permalink. That is awesome. I have a turtle. problem is, mine has sand. and it’s in the wood chips/play area. and it really does bother me when the two get mixed. Plus, 2 problems. It doesn’t matter how often i harp, they never put the lid back when they are done, so any precipitation leaves a pool of sandy water (nasty) and they step on the lid. Arrggh! I know the answer… spend more time with my kids in the yard. But i don’t/can’t do that. I fenced my yard so I could send them out there without me. hmmm.